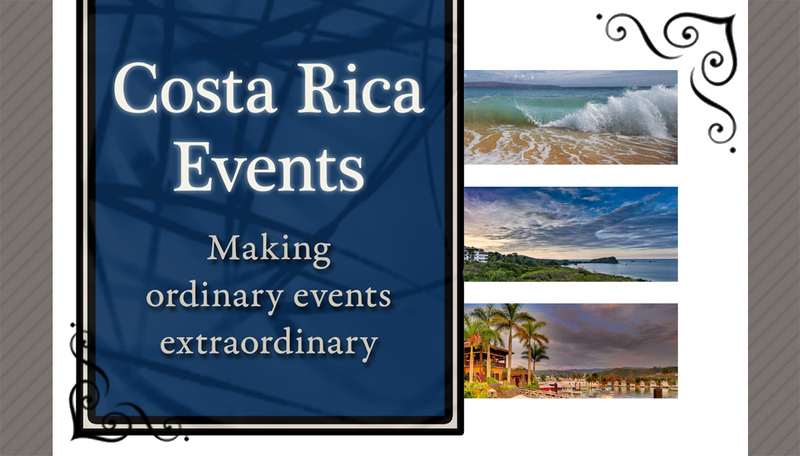 Costa Rica Events brought 30 years of global travel and tourism experience to Costa Rica with plans to start a new business on new turf. They needed a website to attract customers online, to generate leads, and to serve as a credentials site to make a good impression on the many clients they planned to meet in person. They hired Evergreen to design and develop a website for their small business. My first task was to take all the copy, information, packages, and photos that Faith from Costa Rica Events supplied and organize them in the best way possible. I believe it’s important to start with organizing the site content before any work on the look begins in order to ensure a great user experience. Once the content was organized in to categories, pages, files, and folders, I sketched out a few ideas for the site structure. 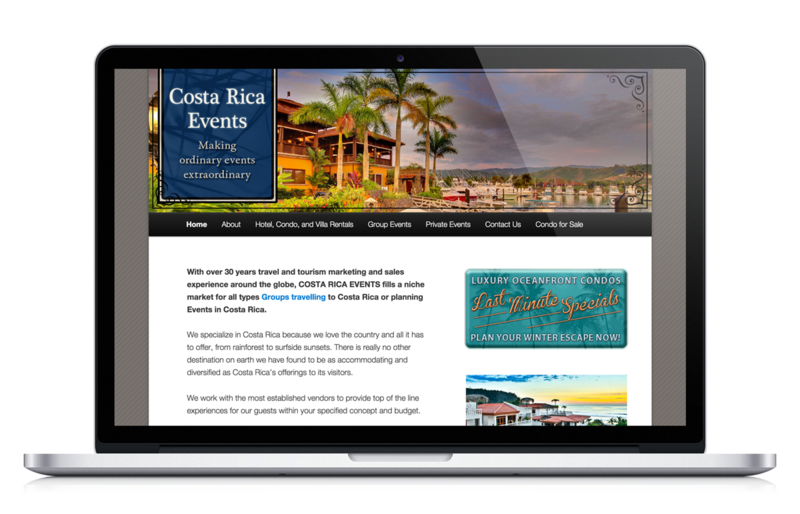 I constructed a look that would represent the business and appeal to Costa Rica Events’ target market, which called for sophisticated and classy with some fun sprinkled in. The whole look was built on this concept – the color palette of gray, black, white, and midnight blue; the diagonal pinstripe background; the corner embellishments in the header; and the logo and tagline on top of a fun texture. I knew this look would go really well with all of the colorful photos we needed to incorporate in to the site. 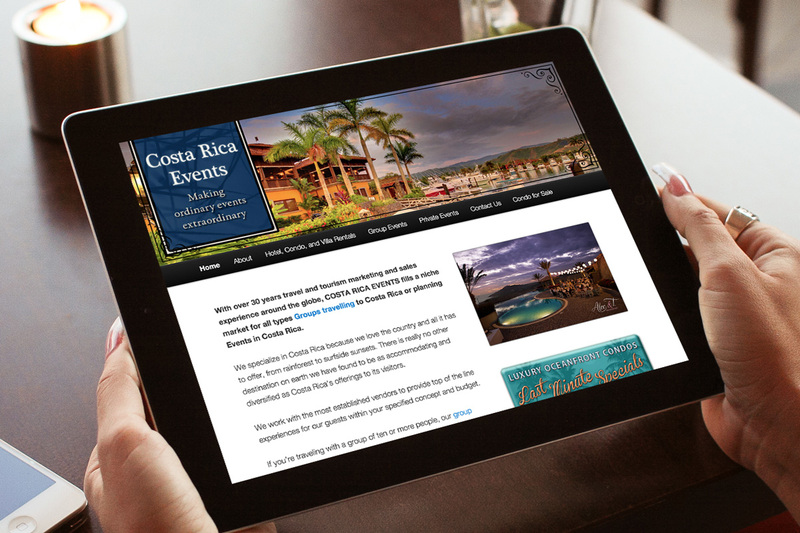 The site design and build fulfilled all the needs of Costa Rica Events and they soared to the first page in Google search results due to my expert SEO advice.